Yes, I disapprove like a rainbow. One cannot really imagine that one can name one's bunny Scruffaluffagus without some real consequences. Wouldn't the world have been better off if Kimberly had just stuck with "Gus"? 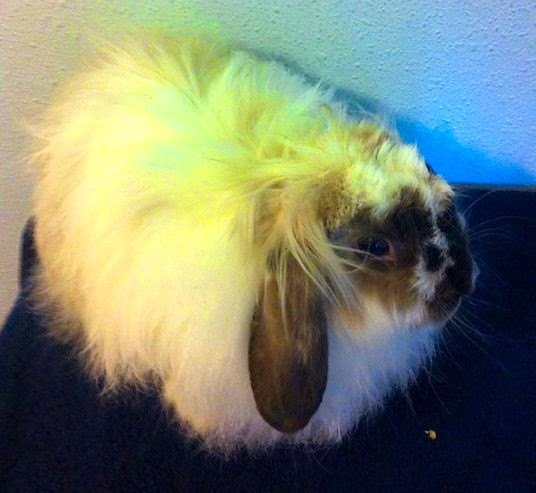 He was given the name at the rescue because when he was found, he was completely matted up and looked very scruffy. I call him Scruffy to shorten the name. I hope Gussy is the big show after the storm and not before it. What a display! Thanks, Kim. Good to know. Bunny rescues around the world have an additional agenda item for their next meeting - new guidelines for naming bunnies. All joking aside, thank you for saving this beautiful bunny from everything including most of his given name. Bless you. Just one more little question, should RG consider Scruffy the eye of the storm?